RUBBLE FLATS and sand flats provide great opportunities for sight-fishing in the tropics. Neither habitat has a lot of structure, but both support sufficient numbers of prey to provide good feeding areas for bonefish, permit, snapper, and a host of other gamefish that venture into these shallow habitats to feed at high tide. Sand flats have been well covered in numerous books on flats fishing, so most of the discussion here is limited to prey of this habitat. Rubble flats, on the other hand, have been shortchanged in the fishing literature, so this section delves a bit deeper. A backreef rubble flat is well protected from waves by a shallow flat. The seagrass growing along the rubble (foreground) and the open rubble bottom (center) probably indicate differences in wave energy during high-wave periods. Note the barracuda (center of picture). Rubble flats are my favorite shallow-water habitats of Caribbean islands because they are home to permit. Even if you don’t find permit, you may still find bonefish, jacks, barracuda, triggerfish, snapper, small sharks, and other gamefish on backreef rubble flats. The typical rubble flat lies behind a coral reef, offshore of which is deeper water. Seagrass and algae eventually take hold in the backreef and spread into the lagoon, which results in a further slowing of currents and more deposition of debris and sand. In some spots, small colonies of finger coral grow among the seagrass. When everything works out just right, a shallow rubble flat results. 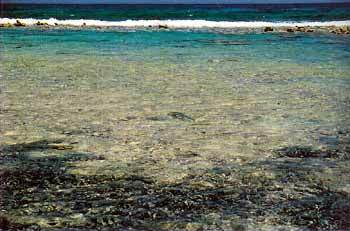 Water depth is the primary factor affecting whether you will find gamefish on a backreef rubble flat. The two factors most influencing the water depth are tides and waves. Tidal range in the Caribbean is generally small, the water level changing a foot or less through a normal tidal cycle. Still, gamefish respond to even minor tidal fluctuations. On shallow flats, gamefish may be completely absent during low tide but may venture far onto the flat in search of food at high tide. Many times I’ve seen this occur even though I’ve been unable to detect a difference in water depth between tides. 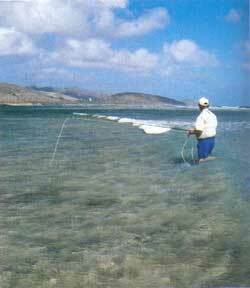 In general, fishing the backreef flats is best from the latter half of the incoming tide through the first hour or so of the outgoing tide. In addition, backreef flats that hold good water throughout the tidal cycle are great places to search for fish at dawn and dusk, regardless of tides. I am not a big fan of early mornings, but when living in the Caribbean, I frequently dragged myself out of bed before dawn to walk my favorite backreef flat at first light. Waves are almost constantly assaulting the outer edge of the reef that protects backreef rubble flats. And as on sandy beaches, the surf pushes water onto the reef. Some of this water is deflected seaward by the coral reef, but some of the water passes over or around the reef and onto the flat. If the reef is relatively deep or the tide is particularly high, a considerable amount of water can push over the reef and create an appreciable current on the flat. In addition, the remnants of larger waves that crashed onto the reef can maintain some of their form and roll across the flat. Both the wave-induced current and the small waves continuing across the flat can dislodge prey hiding among the rubble. In contrast, other reefs and flats are shallow, so under normal conditions, there is little wave energy that continues over the reef onto the flat. These shallow, more protected rubble flats offer a different challenge in presenting a fly to a feeding permit or bonefish. The shallow water means the fish may be more wary of a fly hitting the water, and since the fly can quickly become lost in the crevices among the rubble, you must cast it closer to the fish to make sure it gets noticed. Whether or not the reef and flat are shallow, extended periods with strong surf can increase the water depth more than tides. The constant surf will actually push more water onto the flat than can escape back to sea through cuts and channels in the reef, which can result in higher-than-normal water depths for the duration of the strong surf. Gamefish will take advantage of these high-water periods just as if the high water were due to an extended high tide. An added bonus to the near constant flushing of new water from the incoming waves is that backreef rubble flats rarely get as warm as nearby shallows with less water flow, so they can be good places to fish when other flats are too warm for permit and bonefish. I began working my way across the flat as the light of the dawn sky slowly overtook the glow of the full moon. There was just enough wind to ripple the surface of the small surf rolling gently across the reef and spreading onto the flat. As I stripped out the usual fifty feet of fly line, I saw movement out of the corner of my eye. Glancing to my left, I saw the wake of a permit slowly cruising across the flat. I checked the knot connecting my urchin fly pattern to my tippet and false-cast to get fly line out of the rod tip. The permit tailed 40 feet away. I made a false cast, and then dropped the fly four feet in front of the fish. The unweighted fly dropped slowly to the bottom, but the fish moved off to the left without seeing it. I made another cast, placing the fly a little closer in front of the slowly moving fish. As the fly dropped, the fish surged quickly forward. I saw the end of the fly line jump and set the hook with a strip strike. An angler searching for fish on a backreef rubble flat with less protection from ocean waves. The waves present a new challenge to an angler casting to tailing permit. The fish gave a small head shake, rubbed its nose in the bottom, then bulled fifty feet, rubbed its nose again, and surged another fifty feet. I followed after it as best I could, getting closer to the reef and all of its sharp coral with each step. Then, suddenly, the fish had had enough of the shallow water and bolted through the reef. The rod captured the vibration of the fly line scraping across the coral as it passed through the reef-fraying leader, shredding fly line, and testing the durability of the backing. I lightened the reel’s drag and followed the path of the line as quickly as I could, carefully picking my way through the maze of mostly dead coral, freeing the line from the labyrinth of the fish’s pass through the reef. All the time, the fish was still heading seaward, by now into the deeper water outside the shallow reef. Then suddenly the line was free, the curve in the backing quickly straightened-the fish was still on! I was able to apply some pressure, and the fish slowed and finally stopped taking out line. It began swimming back and forth in the deeper water. As the fish began to tire, its dorsal and tail fins broke the surface. I slowly gained the edge in the battle for backing and finally the fly line. I began to walk back to the flat and the fish followed, tired now and finning at the surface. As I guided the permit over the reef, the sight of shallow water gave it new energy, and the fish rubbed its nose on every coral head it passed. I worked the fish onto the flat many times, only to have it regain its strength and rush back into the reef. Suddenly the situation worsened-after bulling its way into the reef once again, the fish refused my pressure pulling it back to the flat and began to swim back and forth in the reef. I followed as best I could, rod held high as I wove my way through the coral. Then it happened. I lost track of my footing, tripped on a piece of broken coral, and went down. Full body. Flat on my face. Rod, still in hand, fully submerged, an extension of my sprawled right arm. I was completely soaked. I regained my footing and brought the rod back into the upright position. Water gushed off my wide-brimmed hat and flooded from my soaked shirt. I couldn’t believe it-the fish was still on! Then I felt a stinging pain in my legs. A quick glance down revealed a little blood, but it didn’t look bad. My attention returned to the fish with even greater focus than before. The fish continued to move back and forth across the reef, but this time I stayed put. I didn’t dare try navigating the reef maze again. And I was starting to feel the pain of the coral cuts on my legs. I eventually gained enough line so there was only twenty feet of fly line and leader between us. I could clearly see the iridescent glow of the permit’s silvery sides and the yellow hue to its belly brightened by the battle. Even from the side, I could see its shoulders were broad. The fish was tired and had conceded, so I began walking it back onto the flat. With only another thirty feet to a safe spot to land the fish, the line went slack. The leader had finally failed, not with a snap, but with a muted parting. It took both me and the fish by surprise. I stared at the leader in disbelief as the permit continued to swim in the direction I had been leading it. Then the fish felt its freedom, veered off, and slowly swam over the reef. The remnants of the frayed leader dangling from the rod tip and spikes of plastic protruding like cactus spines from the fly line wound tightly on the reel told the story. The pain suddenly reminded me of my fall, and I realized the water around my legs was discolored. I looked down to see that most of my left leg and my right thigh were solid brush burn-scraped, raw, and bruised, but no blood. The blood was from a cut on my right kneecap in the distinct pattern of brain coral. 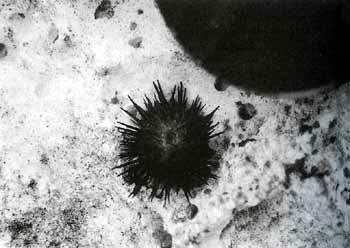 I checked for urchin spines, but fortunately found none. Defeated, I walked back to shore, sat on the beach, and rested, as I let the gash in my knee dry closed. After a few minutes, I made my way back to my truck and home. Permit like to come through the reef to access backreef rubble flats, often riding the energy of the remnant waves through the reef into the shallow water. I’ve even seen large fish swimming sideways to get through particularly shallow areas. This is important to know for two reasons. First, you can look for cuts in the reef that provide easier access to such large fish and focus your efforts on these portions of the flat. Second, when hooked, permit will probably hightail it right back through the reef into deeper water, and you should be prepared for this. Both points can influence your fly-fishing strategy. Once on the flat, permit will cruise the flat, often with their dorsal fins above the water, occasionally stopping to feed, digging their noses into the bottom and flipping their large, forked tails into the air. Prey items for permit in these areas include small clams and snails, sea urchins, crabs, and shrimp. After feeding along a stretch of flat, the fish usually head back through the reef to deeper water. In my experience, for any particular flat, permit feed in the same general pattern. They cross the reef in specific areas, travel along the flat in the same direction, and feed more actively on some sections of the flat than others, often at the same time in the tidal cycle. More intriguing, an individual permit’s feeding pattern often persists on the flat for a few days, so as long as you don’t spook a fish while trying to catch it, you can return the next day and have a decent shot at finding the fish again under the same conditions. Once you’ve spotted a permit, the challenge is to present the fly close enough that the fish will see it, but not so close that you spook the fish. When feeding on the bottom, a permit’s circle of vision is limited; it seems to focus on a rather small section of bottom just in front of, or directly below, its swimming path, so getting the fly close is paramount. It’s like casting to teacup moving across the bottom. One option is to cast your fly directly in front of a slowly cruising fish. This is tough because a fly that splats down on the water will often spook the permit. A second option is to anticipate the path of a cruising fish and cast the fly along this path, well ahead of the fish. As the fish approaches the fly, give it a small twitch. Though this approach works well over deeper seagrass, it can be tough to impossible on shallow rubble flats. Either the small waves rolling across the flat will move your fly out of the fish’s path, or the fly will settle to the bottom and sink into one of the crevices among the rubble and never be seen by the fish. There is nothing quite as maddening as having to wait for a permit to pass by before wading over to unsnag a fly wedged in the rubble. The third, and best, option is to cast directly in front or to the side of a feeding, tailing fish. Let the fly drop to the bottom. If the permit doesn’t react, give the fly a slight twitch, and again let it rest. Most of the prey you’ll be imitating with the flies you cast to permit won’t move much once they think they’ve been spotted. Instead, they try to hide in the bottom. Too much movement to a fly will often send a permit in the other direction. For each of these options, small waves rolling across the flat or wave-induced currents can make fly presentation difficult. But at times when the sea is calm and the water surface is like a mirror, the permit are very wary and easily spooked. It’s a challenging situation under all conditions, which is part of what makes fishing for permit on backreef flats so much fun. If you are lucky enough to hook a permit on a backreef flat, you will be faced with the challenge of keeping your leader in one piece as the fish heads to deeper water-directly through the coral reef. Of the numerous permit I’ve hooked on the fly on these flats, I’ve lost all to leaders that were cut on corals. So you have two options. One strategy, albeit risky, is to clamp down on the drag and hope your line and rod hold as you prevent the fish from running through the reef. A second strategy is to give the fish plenty of line to run through the reef to deeper water, and let it tire itself out. Once the fish has tired, it will come to the surface, and you can work it back over the reef onto the flat. This is the stage of the fight where I have lost many fish, due to either bad luck or impatience on my part. So take your time, even though all of your senses tell you to hurry. Other rubble flats lie close to or along the shoreline. It is common to come across small flats of coral rubble mixed with sand and seagrass as you drive around a Caribbean island. The land topography often continues into the water, so pay particular attention to flat stretches of land where the road passes close to the water. The road may provide shoreline access to a wadable shallow-water rubble flat. Flats that are adjacent to busy roads or walkways are most productive at dawn and dusk, when traffic is low. However, fish that are resident in busy areas sometimes adjust to the activity and are not so easily spooked. That doesn’t mean these fish will be easy to catch. They might not be easily spooked, but they might still be picky eaters or wary of poorly presented flies, or because the flats are so accessible, they might be heavily fished. Other rubble flats are harder to find but can be worth the effort. Small flats off the beaten track will likely have less fishing pressure, so they may hold more fish. These isolated flats have provided me with great fishing over the years. If you have time before your trip, do your best to find a boater’s map, or at least a topographical map. For U.S. waters, the United States Geological Survey (USGS) is a good place to start, as is the National Oceanographic and Atmospheric Administration (NOAA). The Internet is a valuable resource for both traditional maps and aerial photos that can reveal the locations of likely flats. Most islands have a government fisheries bureau, which is worth a phone call, though results are not guaranteed. I’ve found some very good maps in old fishing and sailing books. You don’t need a map detailed enough for navigation, just one that shows you general patterns of inshore water depths and locations of reefs and shoals. Fly-fishing strategies for fishing these flats will vary. On the narrow flats that parallel the shoreline, I prefer to slowly walk the shoreline searching for signs of fish. Walking on the shore provides a higher vantage point so I can see fish at a greater distance. I am also able to quickly move to a location down the shoreline should I see activity such as a tailing fish. Don’t be surprised to see fish right up against the shoreline, especially at high tide or at dawn or dusk. If you don’t see fish after a pass along the shoreline, you may want to wade the middle of the flat. If this strategy doesn’t work, wade to the outer edge of the flat and try casting into deeper water. Such blind-casting might result in a nice jack, snapper, barracuda, or even the occasional small tarpon. If you don’t see fish on your first visit to a flat, try again at a different time of day or a different point in the tidal cycle. I know of a few flats where large schools of bonefish cruise the rubble zone in the last hour and a half of the incoming tide but are completely absent at other points in the tidal cycle. Still other flats have feeding fish at dawn and dusk, seemingly regardless of the tide. The blend of rubble, seagrass, and scattered corals supports a diverse assortment of prey species. Rubble flats with seagrass mixed in have the same suite of prey as seagrass habitats, while rubble flats without seagrass harbor a subset of seagrass prey species. In addition, the many crevices among the rubble are good hiding places for an assortment of other prey species. Chief among them are small members of the spider crab family (Majidae). These crabs feed along the bottom and scurry for the undersides of shells and rubble when chased. Green reef crab (Mithrax sculptus) and tan reef crab (Mithrax coryphe), and to a lesser extent gray pitho crab (Pitho aculeata) and pitho crab (Pitho mirabilis), top the list and are eaten by bonefish and permit. The carapaces of reef crabs are triangular with rounded edges. The pitho crabs are teardrop-shaped, with their eyes at the narrow end of the teardrop. All four species listed here grow to one inch but are often smaller. The abundance of each species varies among locations, but the green reef crab is usually the most common in shallow rubble flats mixed with seagrass. When choosing a fly to imitate spider crabs, your choice of color can be simplified to the basics: dark green, brown, or tan, depending on the species. The pitho and gray pitho crabs are tan to gray in color, the green reef crab is dark green, and the tan reef crab is tan. Porcelain crabs (family Porcellanidae) also inhabit shallow rubble flats. The lined porcelain crab (Petrolisthes galathinus) is especially abundant on finger corals growing on mixed rubble and seagrass flats. The lined porcelain crab is small, at two-thirds of an inch, and medium green. It has an oval carapace and oversize, flattened claws. When fishing flies that imitate these small crabs, the action you give the fly should be minimal. All species of walking crabs remain close to shelter, whether under a rock, among seagrass blades or algae, or burrowing into the bottom, and they don’t scurry over long stretches of open bottom when chased. You may want to give your fly a couple twitches to get the attention of the bonefish or permit, and then let it sit still. Mantis shrimp live in holes among the rubble or shells and are similar in appearance to the praying mantis land insect, thus the name. When living among sparse seagrass with coral rubble or open sand bottom, the golden mantis (Pseudosquilla ciliata) is tan in coloration. The rock mantis (Gonodactylus oerstedii) is typically dark green or black but also varies to match its habitat. It is mostly found among rock and coral crevices. Mantis shrimp usually don’t venture far from their burrows and are most active at night. When chased, their defense posture is to turn and face their adversaries while retreating backward toward their burrows. While these species of mantis shrimp can reach four inches, usually only the smaller ones are eaten by bonefish and permit. Sand flats are pretty simple habitats. There’s not much structure to shelter prey or to hold gamefish, yet sand flats can be great places to fish for bonefish, permit, snapper, and a host of other species because they present an easy habitat for gamefish to feed. The more complex the shelter of the habitat, the harder it is for predators to find and catch prey. So although open sand bottoms don’t host as many prey as seagrass, a gamefish’s chance of finding and catching prey are much higher. Spend some time wading sand flats, and you’ll soon conclude that not all sand flats are created equal. The type of open bottom reveals the typical wave and current conditions an area experiences and can give you a good idea of whether it is a good feeding area for bonefish. Sandy areas with waves or ridges are frequently exposed to waves or currents that cause shifting sands, which tend to have fewer prey organisms than more stable sediments. Stable sediments also tend to be softer because of mixed mud and detritus due in part to the activities of the resident animals, which makes these bottoms more hospitable to more organisms. Sand bottoms occur in areas with more wave or current energy than mud bottoms, or in locations far removed from a source of soft, fine sediments that make muddy bottoms. Rivers, streams, estuaries, or lagoons with currents that might carry sediments are potential sources of soft-bottom sediments. The survival strategies of species that live in areas with stable sand bottoms provide clues to their presence. Many of the species that live on sand flats dig burrows, and they show themselves by the presence of these burrows. These species may filter feed, eat detritus that is delivered by tides, or emerge from their burrows to feed on the surrounding bottom. Clams bury themselves in the sand and extend tubular siphons to the surface in order to filter plankton and other food from the water. Some worm burrows are as big around as a penny, and some species of worms and shrimp discharge large amounts of sand out of their burrows. Such clues indicate that you are on a “live” sand flat that supports gamefish prey. Finding a live flat is an essential first step to finding gamefish. Most gamefish try to get away with as little travel as possible in their search for a meal, so once they’ve found a good place to feed, they’ll use the area repeatedly. After you’ve found a live flat, you can set about figuring out when and how gamefish take advantage of the food source. Polychaetes are segmented worms that come in many body shapes. The many species can be divided into two general categories: tube dwellers and free-moving. Among the most recognizable tube dwellers are numerous filter-feeding species with large, bushy crowns that extend from the worm’s tube or burrow. Christmas tree worms are typical of this group. The colorful crowns quickly retract into the tube if the worm senses danger. Weighted flies with marabou plumes are good imitations of these polychaetes. Free-moving polychaetes search for food along the bottom and may live in a tube, burrow into the sediment when seeking shelter, or simply live on the bottom. They are shaped as variations on the earthworm theme. Bonefish are the most notable gamefish that eat polychaetes with regularity. A good number of crustacean species that occur in other habitats also live on sand flats. Those flats that border grass beds or mangroves receive an overflow of prey from these habitats; sand flats far removed from other habitats harbor a smaller list of prey species. Golden mantis shrimp dig burrows in the sand and emerge at night to feed. Mantis shrimp on sand flats are tan to closely match the color of the bottom. Snapping shrimp also inhabit sand flats. On hard sand bottoms, snapping shrimp shelter in pieces of shell or rubble, as will reef and pitho crabs. In softer-bottomed sand flats, snapping shrimp dig burrows. Juvenile common shrimp, up to three inches long, also burrow into soft sand, leaving a small hole for water exchange, and emerge at night to feed. Many species of swimming crabs also inhabit shallow sand flats and usually have excellent camouflage coloration. Finally, numerous species of small fish are specially adapted to the sand flats, including a few species of small gobies that are either clear or blandly colored to match the sand bottom. The goldspot goby (Gnatholepis thompsoni), dash goby (Gobionellus saepepallens), and orangespotted goby (Nes longus), which makes itself comfortable in the burrows of snapping shrimp, are examples of gobies that live in burrows on sand flats. Pearly razorfish (Hemipteronotus novacula) and rosy razorfish (Hempiteronotus martinicensis) are members of the wrasse family (Labridae) and live on sand flats four feet deep or more. Razorfish hover above the bottom and dive into the sand when threatened. When living over sand, both species are pale in coloration. Since so many of the prey that inhabit sand flats either live permanently underground or emerge at night to feed, it makes sense that gamefish that feed on sand flats have a good sense of smell. They use this sense of smell to find prey. Filter-feeding prey, like clams and some species of worms, draw water in one burrow opening, filter plankton and other food from the water, and then expel the water out another burrow opening. Gamefish that feed on these species can detect the outflow. Even organisms that don’t filter feed aren’t safe. Crabs, shrimp, and other gamefish prey have to pass water over their gills to obtain oxygen from the water, and this leaves a scent on the water that exits their gills. Gamefish are sometimes able to detect this water and track down unseen prey. Bonefish and permit are especially noted for this ability to smell their prey. Since sand flats don’t offer much in the way of shelter, their primary use by gamefish is as a feeding area. Granted, bonefish can get into such shallow water that they can escape sharks, dolphins, large barracuda, and other larger predators, but when they are that shallow, they can be targeted by ospreys and thus remain wary. Because sand flats are so shallow, they can quickly become very warm in the heat of the summer sun and very cold after the passing of a cold front, in both cases making the flats inhospitable to gamefish. Given the wide open character of sand flats, gamefish are usually on the move, and the challenge for fly anglers is to interpret the flats to figure out the best places to intercept these traveling gamefish. The biggest factor influencing the use of sand flats by gamefish is tides. It doesn’t take much of a tidal change to influence the coming and going of gamefish. The well-known standard behavior for gamefish on sand flats is to follow the rising tide onto a flat and to reverse course and leave the flat with the dropping tide. Early in the incoming tide, the edges are the first places to look for fish coming onto the flat. As the tide rises, fish come over the edge and onto the flat, often using traditional routes to access the flat. At the very least, this behavior pattern means that even exploring a flat at low tide can bring rewards. If you happen upon fish concentrated along an edge, you’re probably close to one of these traditional avenues of access. With a little searching, you’ll probably find a small channel nearby that, even if very shallow, serves as the first access point to the flat on the rising tide. But before you get too excited, there’s a catch-the locations of these avenues may change depending on the magnitude of the tide. Spring tides occur with every new and full moon and cause higher-than-normal high tides and lower-than-normal low tides. The high spring tides flood more of the sand flats than at any other time in the tidal cycle, so gamefish tend to venture farther onto the flats in search of prey. And since more water moves onto and off the flats during spring tides, the currents are stronger. The combined higher water and stronger currents can cause a shift toward shallower locations as avenues of access for gamefish waiting to get onto the flats and exit avenues on the dropping tide. In contrast, neap tides occur at the first and last quarters of the moon and cause lower-than-normal high tides and higher-than-normal low tides. These tend to limit gamefish to smaller portions of the flat and to deeper access points. Each type of tide has its advantages. During spring tides, gamefish know they can access parts of the flat that are normally unreachable, so they are eager to move onto the flat once the tide begins to flood. But because the amount of time between high and low tides stays the same regardless of tide height, the permit, bonefish, snapper, or crevalle jack must cover a lot more ground in a limited amount of time. In the worst case, although the shallow sand flat is “live,” it is too far from the safety of deep water to attract gamefish in all but the most extreme tides. In the best case, gamefish will flood the flat with the tide and feed aggressively as they move through. In general, because of the risk associated with traveling too far on a high spring tide, gamefish start to leave the shallows in the early part of the falling tide. Gamefish are still keyed to the tides during the neap tides but tend not to venture as far onto the flat or to feed as aggressively on the rising tide. While this might seem like a negative, it’s not, because gamefish are more likely to feed throughout the tidal cycle than to focus on the rising and early falling tides. This is especially true of bonefish and permit. The one caveat to following the tides in your fishing is the weather. Specifically, atmospheric pressure and wind can affect water level more than the tides in much of the tropics, where the normal tidal range is minor. High pressure and strong offshore winds cause lower-than-expected high and low tides, whereas low pressure and onshore winds cause higher-than-expected water levels for both tides. Given the tuned-in nature of shallow-water gamefish, these weather changes can influence gamefish behavior much the same as spring and neap tides. Tides and wind move water, which creates currents. Most of the time, it’s true that you’ll find gamefish on sand flats moving into the current, but take an occasional peek behind you as you wade a sand flat for that occasional fish that rides with the current. A less obvious aspect of currents is that they affect water temperature. During warm times of year, the water on sand flats can become too warm for comfort for gamefish. Rather than abandon the food-rich flats for the season, gamefish use the currents to their advantage. Tidal currents carry cooler water from adjacent deeper areas onto the flats with the rising tide, and if the incoming tide is strong enough, gamefish will ride the cooler water onto the flat to feed. During colder seasons, the midday sun will heat the shallow water over the sand flats. As the tide rises and is warmed by the sun and by the sun-baked sand, gamefish move onto the flat to feed. When the sun-warmed water begins to depart the flat on a dropping tide, it’s worth searching out channels that drain the flat. Gamefish holding at the ends of these channels get the benefit of intercepting prey that is washed off the flat, as well as the extra warmth of the solar-heated water. So when coming up with a strategy for fly-fishing a sand flat, you need to consider tides, wind, atmospheric pressure, currents, and temperature. Whether you find fish or not, it is worth making notes of the conditions on the flat, and fishing the flat under different conditions. It won’t take long for you to figure out the patterns of the fish. If you are traveling to an unknown area for just a couple days, take the time to figure out the local tides and weather conditions, and make your best guess on where the fishing conditions will be optimum.